MIT Media Lab spinoff Formlabs is one of the few 3D desktop 3D printing companies that has managed to buck the trends of a shrinking field. The startup found success by embracing stereolithography (SLA) printing, a technology that was previously the realm of hulking, industrial printers. Previously far too expensive an unwieldy for many prototypers and hobbyists, the technology was much sought after for precision and detail you can't get with standard FDM printing. With its latest devices, unveiled today at the Additive Manufacturing conference in Hannover, Germany, the company promises even more accuracy and detail than earlier models. The Form 3 and and Form 3L mark the debut of a technology the company has deemed Low Force Stereolithography — or LFS. The new spin on the tech utilizes a similar resin based approach as SLA, but can offer more repeatable design for small scale manufacturing. "We entered the industry seven years ago with the first powerful, affordable desktop SLA 3D printer and since then have shipped more than 50 thousand printers, and our customers have printed more than 40 million parts," co-founder and CEO Max Lobovsky said in a release tied to the announcement. 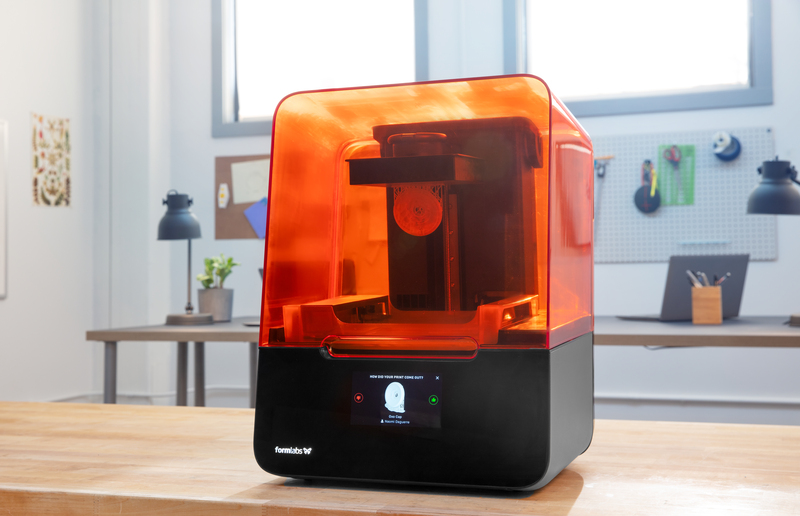 "We're excited to take another huge leap forward with LFS 3D printing, dramatically improving the print quality and reliability people can expect while still offering the most powerful and affordable 3D printer on the market." Along with increased accuracy, the new machines feature real-time health updates, remote printing and modular designs, so users can swap out parts to keep them going. Like many of the updates, these appear to be designed at moving these machines beyond prototyping into small manufacturing devices. That, after all, is commonly agreed to be the next major step for these sorts of products. In 2017, the company introduced the Form Cell, an array of top to five connected Form 2 printers That device was paired with a Wash and Cure system to ready products for small scale manufacturer. The Form 3L, meanwhile, features a print size that's between three to four times the size of the one offered on the Form 2, which puts it more in line with the build volume offered on far more expensive 3D printers.